The Boeing 787 Dreamliner is a mid-sized, wide-body, twin-engine jet airliner under development by Boeing Commercial Airplanes. Its maximum seating capacity is between 290 and 330 passengers, depending on variant. 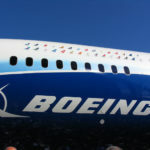 Boeing states that it will be more fuel-efficient than earlier Boeing airliners and will be the first major airliner to use composite materials for most of its construction. The aircraft’s maiden flight, originally planned for September 2007, took place on December 15, 2009. The longest-range 787 variant can fly 8,000 to 8,500 nautical miles (14,800 to 15,700 km), enough to cover the Los Angeles to Bangkok or New York City to Taipei routes. It will have a cruise speed of Mach 0.85 (561 mph, 903 km/h at typical cruise altitudes). The 787 will seat 240 in two-class domestic configuration, with a 46-in (116.8 cm) pitch for first class and a 34-in (86.4 cm) pitch for coach class. 296 passengers can be seated in a high-density 3+2+3 / 2+4+2 coach arrangement with 36-in (91.4 cm) Business and 32-in (81.3 cm) Coach pitch. Arbeitssuche – Blog erstellt, vielleicht finde ich was?